In the tradition of Kundalini yoga as taught by Yogi Bhajan, the human has 10 bodies, not just one. Yogi Bhajan taught that the seventh body is the Auric Body and it is an electromagnetic field around the body that protects and guides you. 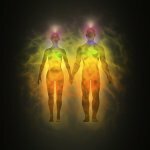 The aura expands between 3 to 9 feet on each side around the human body. 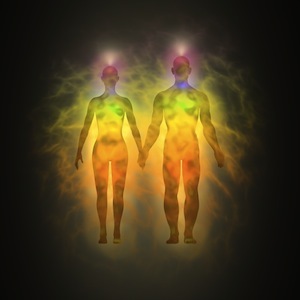 Both size and density matter in the Auric Body, so you want to develop a large and strong aura. A strong arcline protects one from the thoughts and projections of those distant to us, but the aura protects us from those in close proximity to us. Often people dislike crowds and feel threatened by the energy of others need to strengthen their auras. Insecurity is a sign of needing to strengthen your aura. A strong aura brings you strength, health and an angelic nature. It leads to serenity and security. People with strong auras are often very heart centered. The Auric Body connects to the Pineal gland (bringing intelligence) and corresponds to the immune system (bringing health). To increase either intuition or health, strengthen the aura. The aura is created by the flow of prana through energy meridians. Strong prana helps to increase this flow and build up the aura, leading to a synergistic relationship with the Pranic Body. A strong Auric Body leads to more strength in the Pranic Body, which is turn pumps out more prana for the aura to build on. People born in July or born on the 7th, 16th, or 25th day of the month would do well to strengthen their Auric Body/aura. Try this pose out everyday, starting your mornings with 3 minutes and building up to 31 minutes per day in an acute situation where you need auric protection. Ego eradicator cleans and builds the aura. 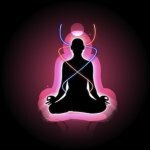 There are several Kundalini yoga kriya specifically to strengthen the aura. Many manuals include kriya and meditation to build the aura. Guruchander Singh Khalsa in Tantric Numerology recommends eating yellow, sweet foods to strengthen the aura such as pineapple, mango, peaches, papaya, and bananas. Gemstones such as citrine are considered aura builders. Wearing white builds up the aura an additional 1-3 feet. This is partly why Kundalini yoga teachers wear white while teaching…to build their aura for protection and intuition. Check out the best selection of white cotton yoga clothing at SpiritVoyage.com! Drink lots of water to cleanse the aura and regularly immerse yourself in water, whether it is with a shower or plunging somewhere as grand as the Ganga River or the Golden Temple. Water can shift energy patterns. Nirvair Singh Khalsa, in his book “The Ten Light Bodies of Consciousness” recommends using the song “Mender of Hearts” by Singh Kaur to strengthen the aura. All meditation helps to strengthen and purify the aura. Thinking good thoughts, clearing the mind of negativity, and just quieting into your breath all help maintain a bright aura. 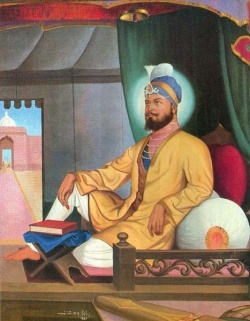 Guru Har Rai was the 7th Guru of the Sikhs during a very peaceful period. He embodied mercy and love, believing that God is Love and valuing pure and honest devotion. He was known for his dedicated personal practice. Thank you so much for this very clear information on the auric body. Many topics in Kundalini Yoga can be found in many book and on many websites. fills in the blanks and gives me lots of Aha! Of course-moments. Like instant understanding. Sat Nam, Ramdesh. Thank you for your clear and to-the-point answer on the relation between the 7th and 8th bodies. But actually, my question is related to the Aura considered both as 7th Body and as 8th Chakra (http://www.3ho.org/kundalini-yoga/kundalini-yoga-yb/chakras/8-major-chakras/)… Is there any suggestion you could make on how the nature of Aura is such that it can be considered both as a body AND as a chakra… or on how I could deepen this study? 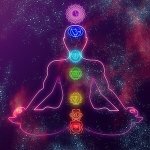 Dear Ramdesh, could you please tell us something on the relation between Aura as the 7th body and Aura as the 8th chakra?